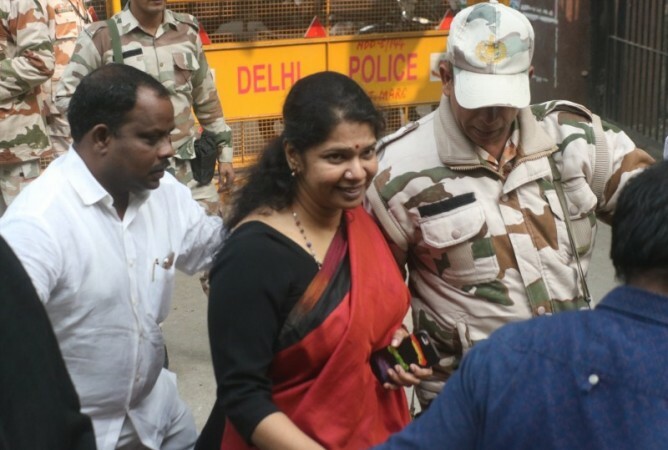 A grand reception was accorded to DMK leaders, Rajya Sabha member Kanimozhi and former Union Telecom Minister A. Raja, on their arrival at the airport here on Saturday after their acquittal in the 2G spectrum allocation case. DMK leader M.K. Stalin welcomed Kanimozhi and Raja at the airport. A large number of DMK leaders and cadres were assembled at the airport to greet them. Folk artists of varied disciplines performed at the airport as part of the welcome party. Wading through the crowd, Kanimozhi and Raja assembled at a designated place and received shawls presented by the party cadre. A senior airport official told IANS that the route leading to the departure terminal was clear and the DMK melee did not affect passengers entering the airport to catch a flight. However, passengers landing at Chennai faced some problems and the police were requested to help them out, he added.